At International Collectors Associates, we understand that when it comes to growing profits and safeguarding your wealth, the journey is just as important as the destination. Your worldview must be the guiding force in setting your ultimate goals and determining your strategy for achieving them. The good news is, you don’t have to go it alone. To build a strong financial base and position yourself for maximum profits, it’s imperative you partner with a trusted expert and advisor who not only enjoys a documented track record of success, but more importantly, understands your goals and shares your worldview. International Collectors Associates is not your typical financial services company. And you’re not a typical investor. We get that. When it comes to building a strong investment portfolio, you’ve never followed the crowd. You already know following the masses is a shortcut to disaster, and ‘mainstream wisdom’ is anything but wise. If you’re going to build profits and safeguard your wealth, you’ve got to stand back and examine the big picture. Read the signs, analyze the trends, and ultimately position your assets and your investments where their profit potential will be maximized while securing your financial future. Fortunately, the experts at McAlvany ICA stand ready to help. Today, ICA is fortunate to have Don’s son David McAlvany at the helm. Immersed in his father’s geo-political and financial worldview, and trained at his side, David brings the same razor-sharp wisdom and discerning mindset to the table that sets ICA apart from other financial services companies. Clients of McAlvany ICA have been relying on their wisdom and counsel for more than four decades, and have benefitted financially and personally from their advice. Every member of the staff at ICA has been personally chosen and trained by David and Don McAlvany. Staff members like Drew Crowell can be counted on to bring you the full range of the McAlvany expertise and experience. Drew is one of America’s foremost numismatists (coin specialists) and has been on the ICA team since 1982. Drew credits his early training as a teenager in a coin shop for his conservative grading and his insistence on better quality coins. Although a big advocate of PCGS and NGC graded coins, Drew still inspects every coin that ICA sells to ensure that only the best are selected for ICA’s clients. Every member of our staff brings this same depth and breadth of knowledge to bear in assisting our clients in building a safe, yet highly profitable investment portfolio. In 1972, Don McAlvany became aware that the rules in America were rapidly changing. Founded on individual liberty and constitutionally-protected rights, America was losing its heritage as the land of the free and home of the brave. A fundamental shift was underway in America economically, politically, morally, and culturally, and wise Americans needed to wake up. At the time, it was still illegal to sell or own gold bullion in the United States. Don recognized the importance of fortifying his client’s investment portfolios against impending wild inflation, government turmoil, and economic uncertainty. He and his wife Molly astutely designed their own line of religiously-themed gold and silver medallions (legal under the law) as a way to build a foundation of financial safety and stability. It was a brilliant strategy that helped many of his clients ride out the wild inflation running rampant during the tumultuous 70’s. But he was just getting started. Today it is even more imperative that the cornerstone of your investment portfolio, including your IRA, be anchored in physical precious metals. Unlike most investments, gold and silver are not simply a “paper promise” to pay back funds at some later date. Gold is the only true money. Its value cannot be undermined by politicians or the whims of central bankers who print money at will, making their currencies worth less each year. Unlike paper money, gold holds its value. Gold is the most liquid financial asset there is. It knows no borders, is recognized throughout the world, and can easily be transported or concealed. For this reason, owning gold represents financial privacy and independence. Gold frustrates the attempts of governments to completely control the finances and lives of their citizens. At ICA, our experienced advisors can help you determine which investments are appropriate for your investment objectives. Physical precious metals are the “insurance” component of your investment portfolio, hedging systemic risk and protecting against the ravages of inflation. 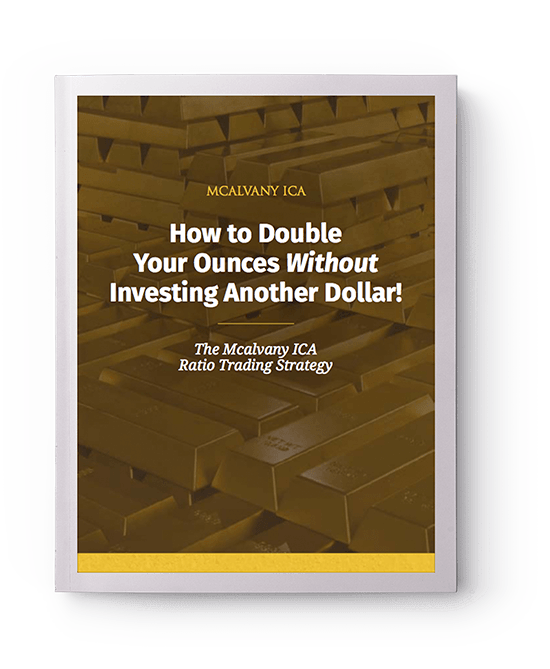 In the past ten years precious metals have also shown consistent and high growth rates, fulfilling, in part, the growth mandate of your investment portfolio. Gold investment not only offers safety to your portfolio of assets but offers the opportunity of a truly growth market. Through planned diversification of their assets, ICA’s clients did not suffer the shocks of the recent stock market and real estate market meltdowns, when so many Americans lost 40% to 60% of their investments and retirement funds. At the same time, clients who listened and followed our advice are now enjoying profits well into the triple digits in their precious metals portfolios. Over the past 40 years ICA has grown into one of the largest full-service precious metals providers in the United States. ICA’s staff of highly-qualified, like-minded, conservative advisors and support staff work diligently to establish long-term relationships with investors and collectors. ICA is renowned for the breadth and quality of the physical precious metals it offers its clients, with life-long guarantees to buy back these products at current market prices. Your experienced ICA advisor will gladly counsel you on the attributes of physical bullion coins and bars, semi-numismatic and collectible coins, and on diversification of storage. Continuous and in-depth study of economic, monetary and geopolitical events and trends, which impact investment themes, is a top priority within ICA and the McAlvany Financial Group. Our advisors have an average tenure of over 20 years with ICA, and have experienced both bull and bear market cycles in precious metals. Call ICA today at 1-800-525-9556. We want to hear about you, your investments, and your financial goals. Let us tell you about how ICA can help you achieve those goals, while riding out the political and economic uncertainty inherent in our world today. In twenty, ten, or even just five years, you’ll be very glad you did.